Heat the oven to 375°. Cut each of the apples into 4 sections on the cutting board, using the knife. Cut out the apple core and seeds. Peel apple sections with the knife. Cut apple sections into slices (you should have about 4 cups). Put apple slices in the pan. Put the brown sugar and cinnamon in the small bowl. Stir with the spoon until mixed. Sprinkle sugar mixture over apples. Pour the water over apples. Put the flour, granulated sugar and margarine in the medium bowl. Mix with your hands until the mixture is crumbly. Sprinkle crumbly mixture over apples. Bake 45 to 50 minutes or until apples are soft and topping is golden brown. Use the pot holders to take pan out of oven. Cool for 10 minutes on the wire cooling rack. Serve with ice cream or the whipped cream, if you like. Apples have real peel appeal. You don't have to peel the apples - if you leave the peel on, just make sure you take out the core and seeds. There’s a reason “easy” is in the title of this recipe, all you need are a few pantry staples and four apples. Finally, an easy apple crisp recipe made for those lazy fall days when all you want is a scrumptious dessert that tastes like the outdoors, crisp and spicy. If you happen to have ice cream on hand, we recommend serving it atop a heaping mound of this easy, seasonal crisp. Now that you’ve fallen in love with all things apple, consider reading up on all the ways you can bake with apples. 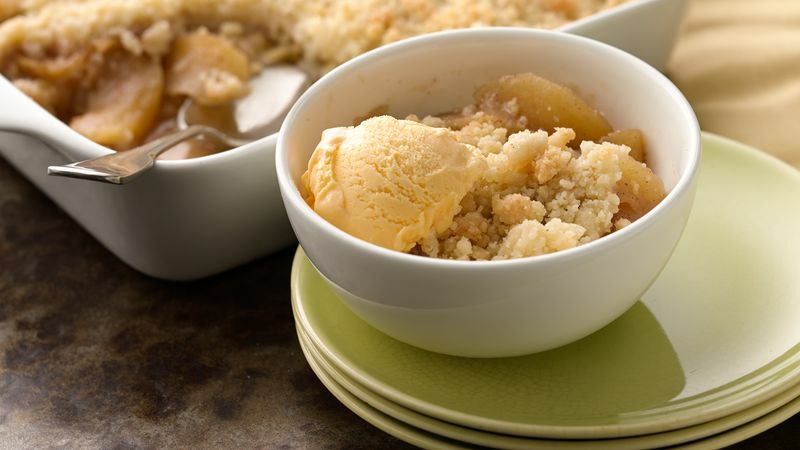 Then, try out a few more of Betty’s most popular apple crisp and cobbler recipes!